This exhibition highlights the extraordinary vitality of queer nightlife in San Francisco’s South of Market (SoMa) district during the darkest years of the AIDS crisis, an era that simultaneously marked the peak of AIDS activism and queer militant organizing in the city. “SoMa Nights: The Queer Club Photography of Melissa Hawkins” focuses on the work of Melissa Hawkins, a young photographer for the San Francisco gay weekly The Sentinel and other publications from 1986 to 1994. Her black-and-white images vividly capture the scene with a combination of frankness and intimacy reflecting her dual roles as journalist and nightlife participant. Melissa Hawkins, Dancer, 1015 Folsom (1991), used with permission. In an era before digital photography and at a time when some LGBTQ people were still hesitant to make their identities public, Hawkins had both the gear required to shoot first-rate photos and the connections needed to gain the trust of her subjects. The results are powerful images documenting parties at 177 Townsend, 1015 Folsom, The Eagle, The End Up, The Rawhide and The Stud in SoMa, as well as The Box in the Western Addition. Co-curated by Hawkins and nightlife historian Marke Bieschke, the GLBT Historical Society Museum show features dozens of these never-before-displayed photos, along with memorabilia including flyers, posters, clothing and decorative artifacts selected to recreate an indelible moment in San Francisco and queer nightlife history. To purchase the limited-edition exhibition catalog, click here. Melissa Hawkins, Phatima and MichaelAngelo (undated), used with permission. Melissa Hawkins is a photographer and multidisciplinary designer. 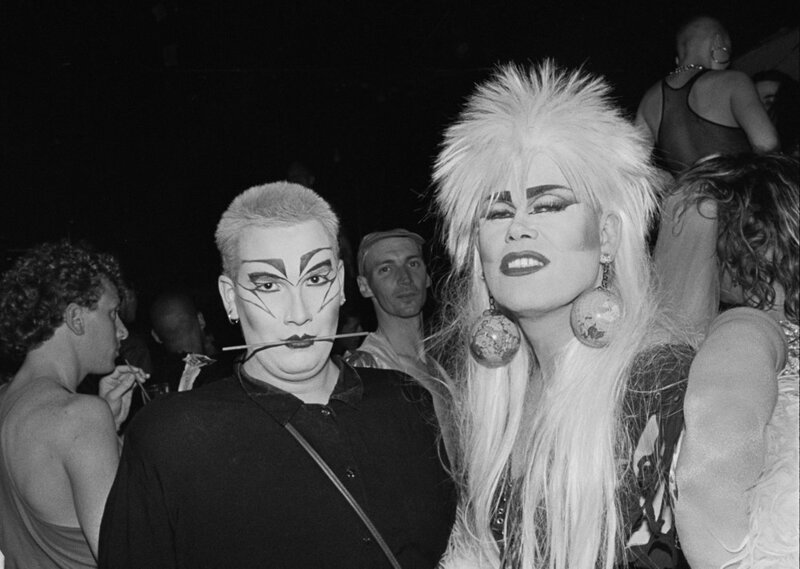 Her photographic oeuvre of the 1980s and 1990s captured San Francisco’s queer community. Many of the images were taken in the South of Market (SoMa) neighborhood in clubs popular during the era. Artwork by Hawkins has appeared in group and solo exhibitions in San Francisco at Cell Space, Flash Art, Frisbee Street Galleries, LincArt and New Langton Arts. She received a “best idea” prize from the San Francisco Renaissance Center and was a finalist in the SF Weekly Mastermind Competition. Hawkins holds a degree in industrial design from San Francisco State University and studied product design at Brunel University in England. “SoMa Nights: The Queer Club Photography of Melissa Hawkins” is sponsored by 48 Hills, Fort Point Beer Company, Galleria Scola, The Lone Star Saloon, Precept Wine and The Stud. Banner photo: Melissa Hawkins, Duo with Cigar, The Eagle (undated), used with permission.